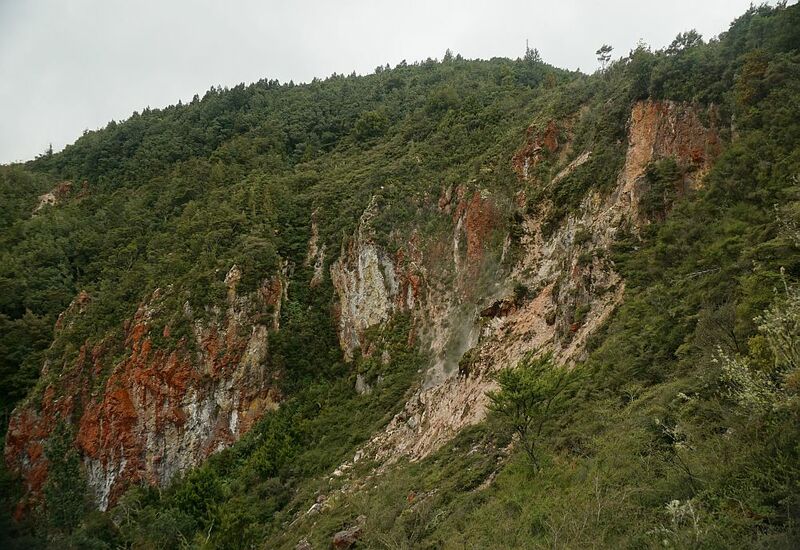 Rainbow Mountain – Maungakakaramea is located adjacent to SH5 and SH38 between Rotorua and Taupo. 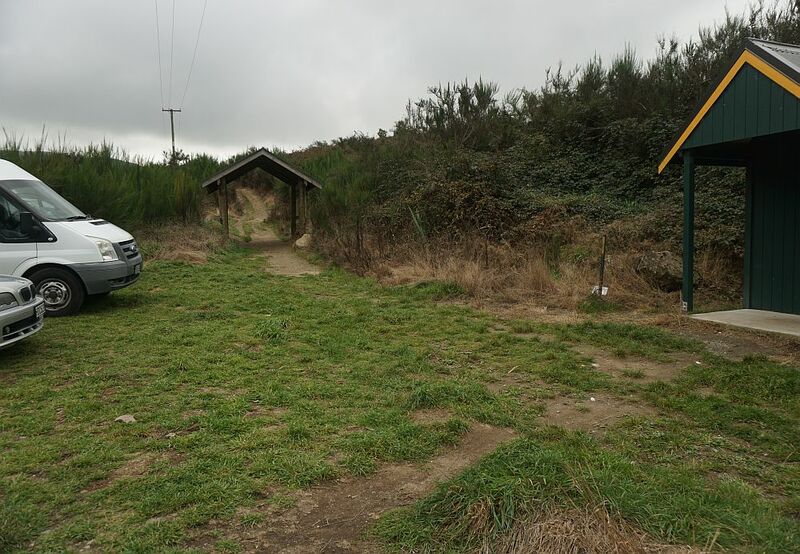 There is a parking area just south of the SH5/SH38 intersection, across the road from a rest area by Lake Ngahewa Recreation Reserve. 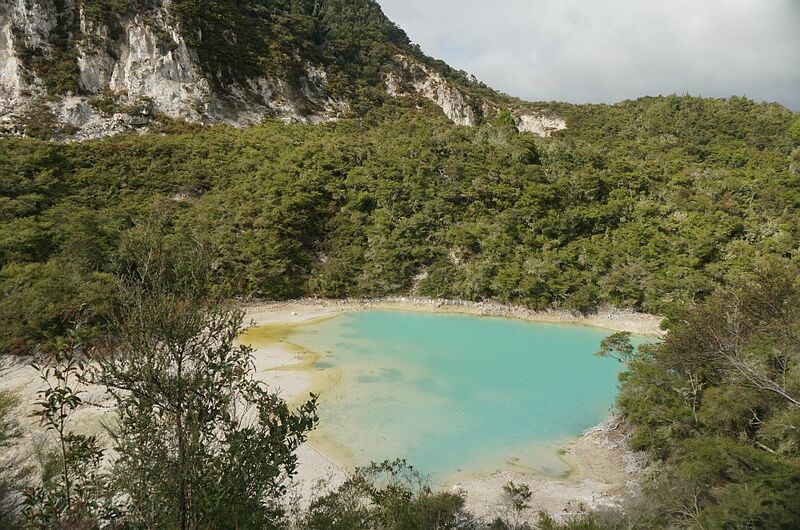 The mountain is located in an area with geothermal activity, with Waimangu, Waiotapu and Waikite geothermal areas nearby. The mountain itself has a number of themal vents, and steam can be seen rising in numerous locations. 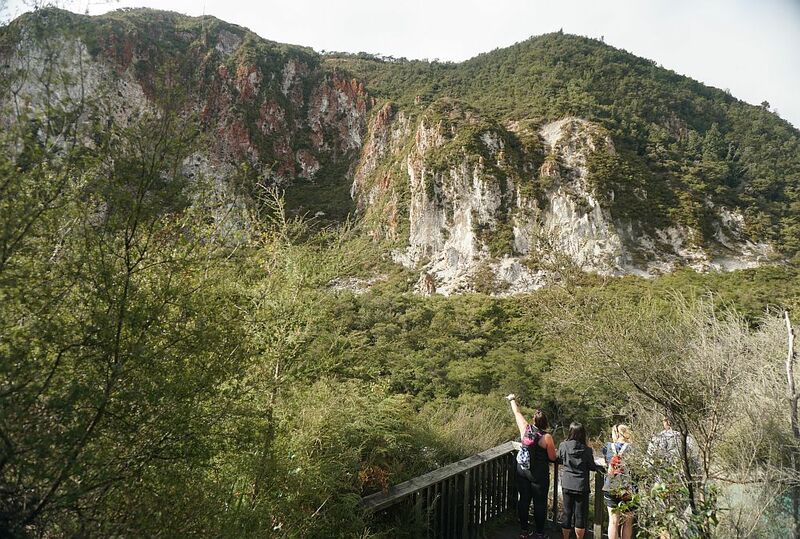 The track to the summit of Rainbow Mountain is a shared walking and mountain biking track. 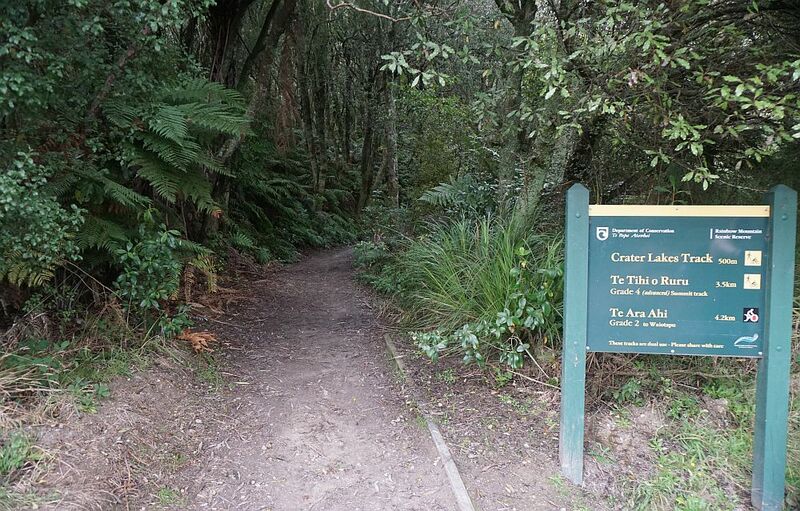 Mountain bikes are only permitted to ride up the summit track, with a dedicated downhill track where walkers are not permitted. There is also a vehicle access track to the summit. There are basic toilet facilities at the SH5 carpark and at the Kerosene Creek carpark. Dogs are not permitted on the tracks, but despite this some people still take their dogs for the walk to the summit. Information about the area and about the tracks is available on the DoC web site. 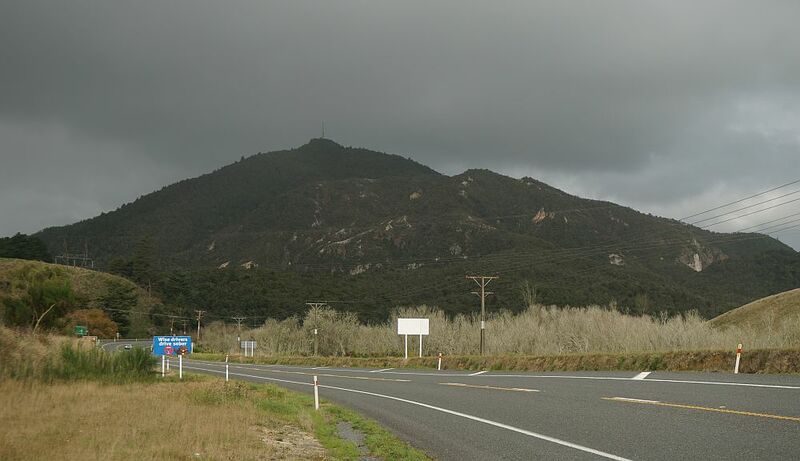 The carpark on SH5, with Rainbow Mountain in the background. The actual summit is not visible, but the mast at the summit can be seen to the left of the highest visible point. The track seems to be quite popular. 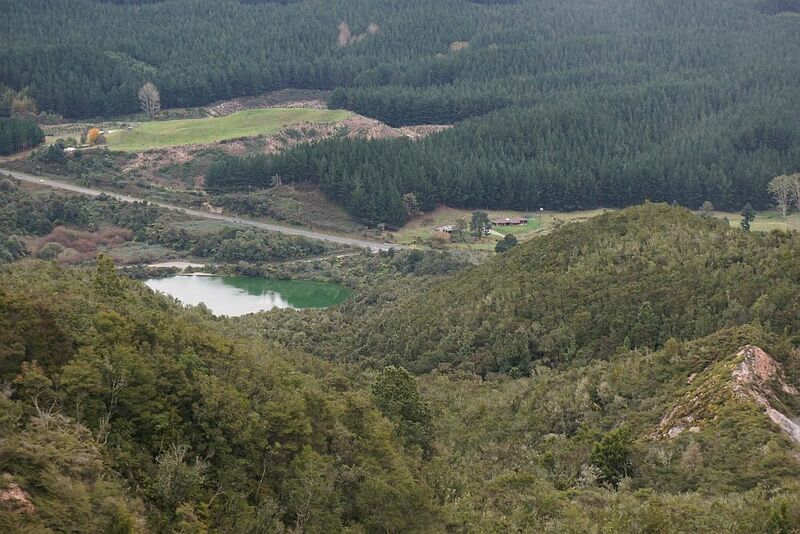 Lake Ngahewa and a rest area are just across the road from the Rainbow Mountain carpark. 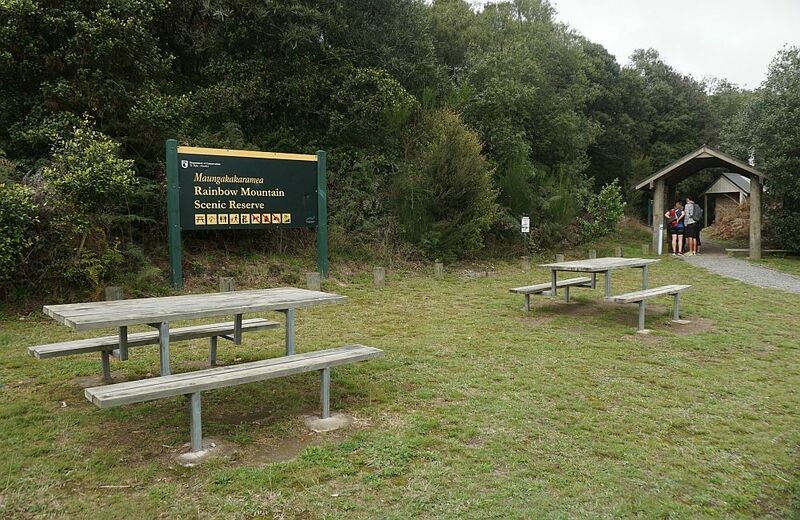 Picnic tables, signs, and information panels inside the archway at the entrance to the walking and mountain biking track to the crater lakes and the summit. The start of the track. The track has a similar width for most of the way to the summit. 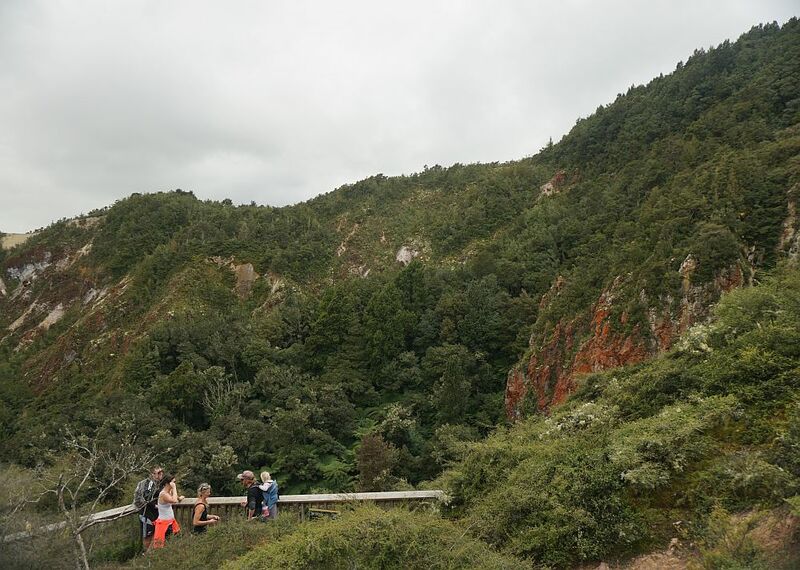 A short side track leads to a viewing platform above the crater lakes at the base of the mountain. Views to the crater lakes. 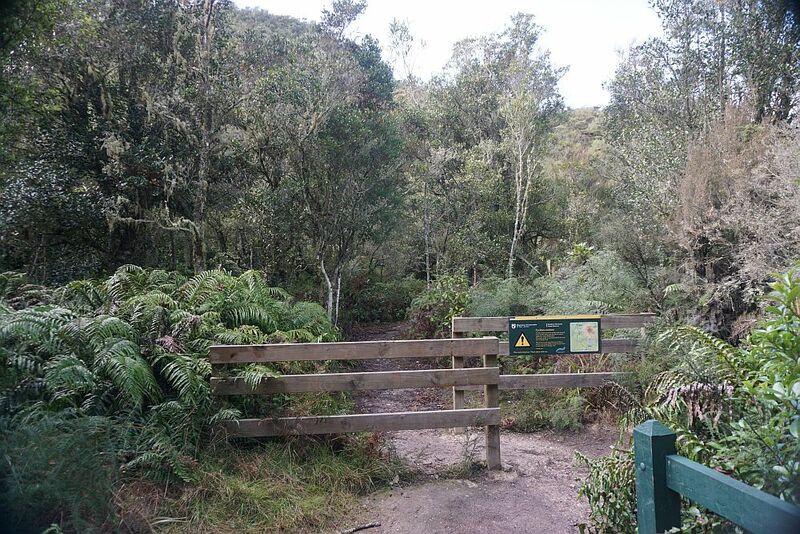 The start of the summit track. 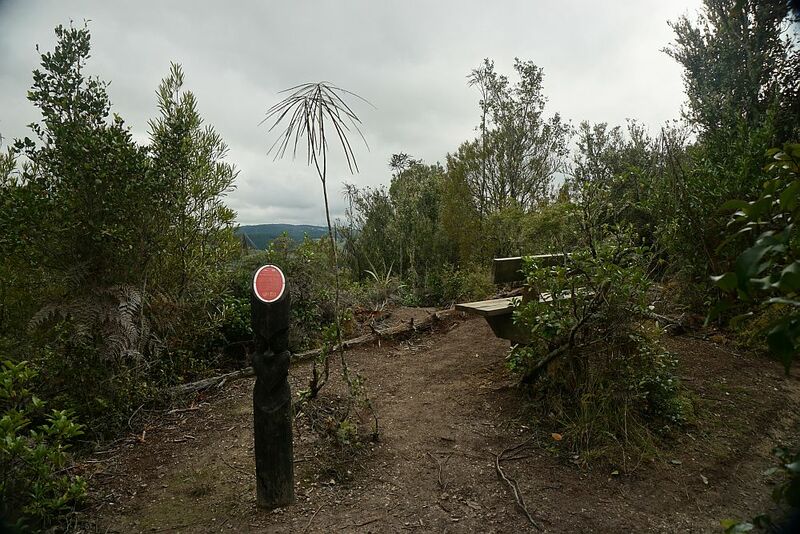 Mountain bikers are warned that this track can only be ridden in an uphill direction, and that the downhill track is grade 4 and only for expert mountain bikers. 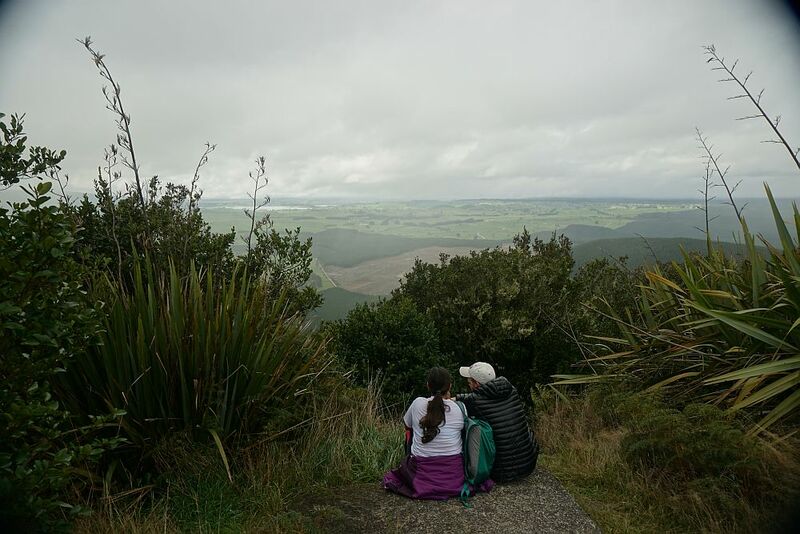 A bench seat for enjoying the views is provided about halfway up the mountain track. A viewing platform nearer the summit provides views across the steep faces above the crater lakes. Steam can be seen escaping from vents on the hillsides. 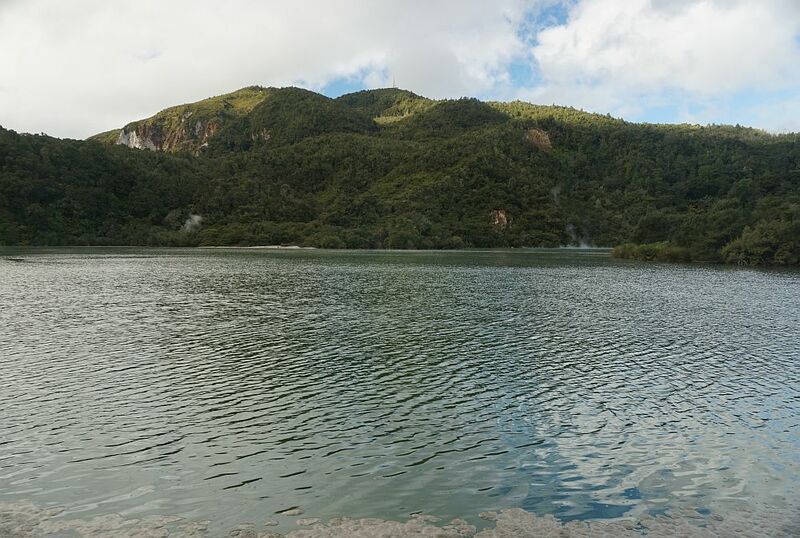 The steep hillsides above the crater lakes. 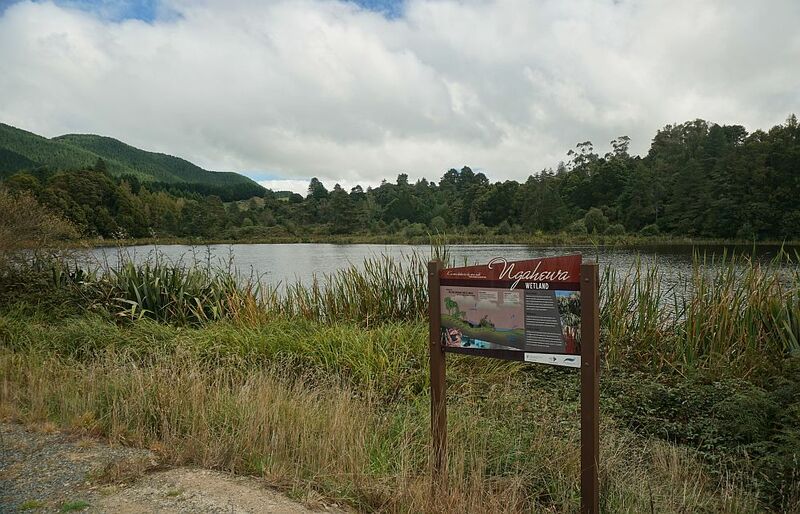 A view to Rotowhero – Green Lake, accessible from Old Waiotapu Rd. 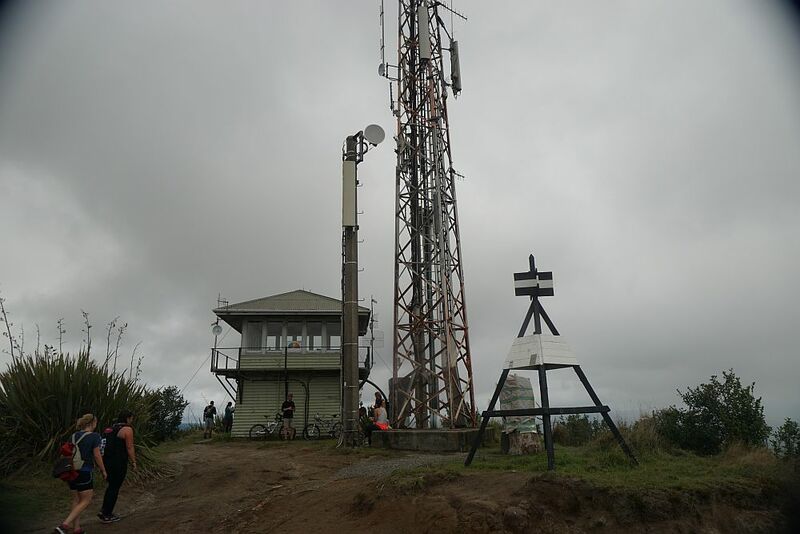 The lookout at the summit, together with the trig station and transmission tower. The summit is 743 m above sea level. Before the advent of web cameras the lookout would have been manned during summer months for detecting forest fires. Unfortunately clouds rolled in and it started drizzling at the summit, so there were very limited views. 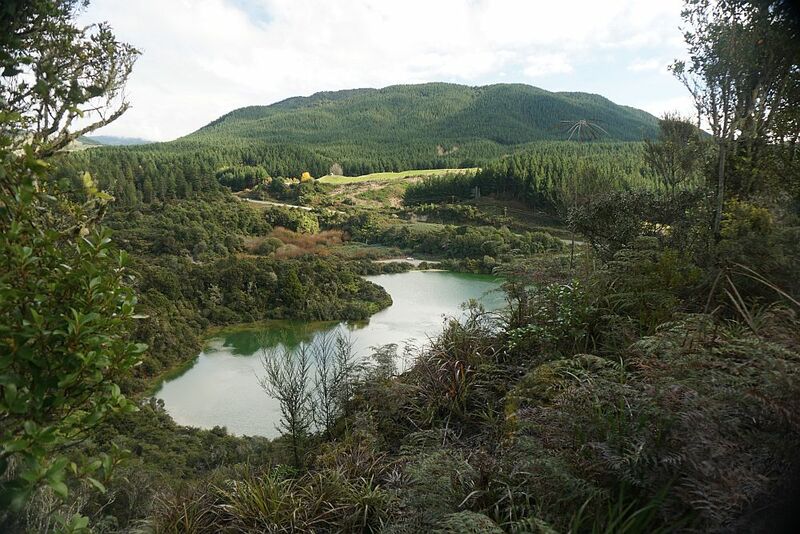 Another view of Green lake, from the track to Kerosene Creek. The end of the track at Kerosene Creek carpark. 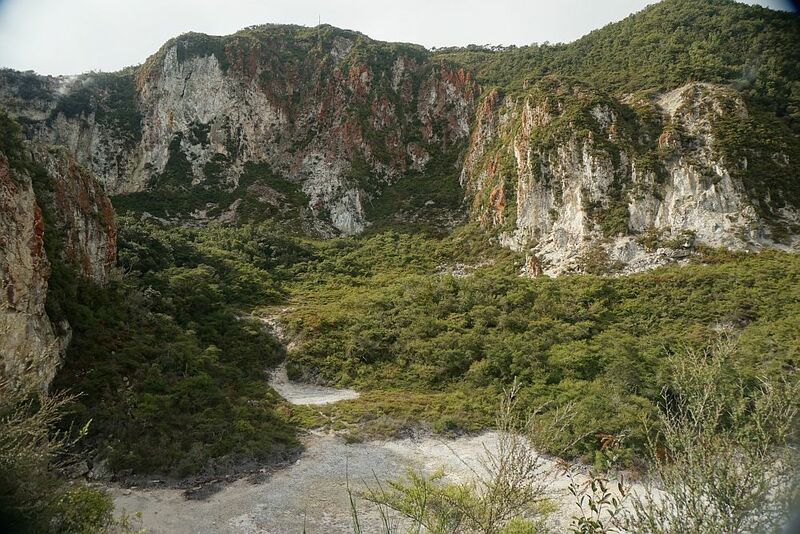 Kerosene Creek carpark is at the end of Old Waiotapu Rd, and is only accessible by vehicle during daylight hours. Kerosene Creek is a very popular spot. 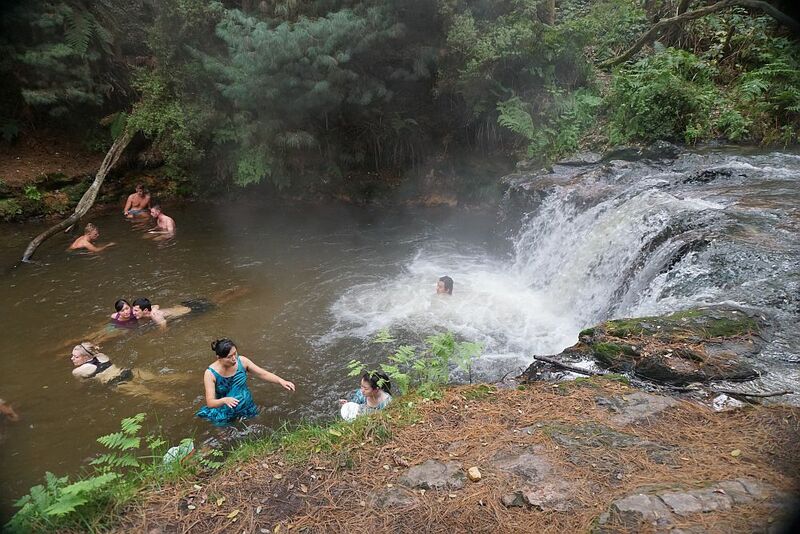 The stream is at a pleasant temperature for bathing, even on colder days. There is no charge for admission, but the access road is gravel and full of potholes, so it’s a slow 2 km drive from SH5 to the carpark. The swimming holes are only about 100m from the carpark along a well-formed track. 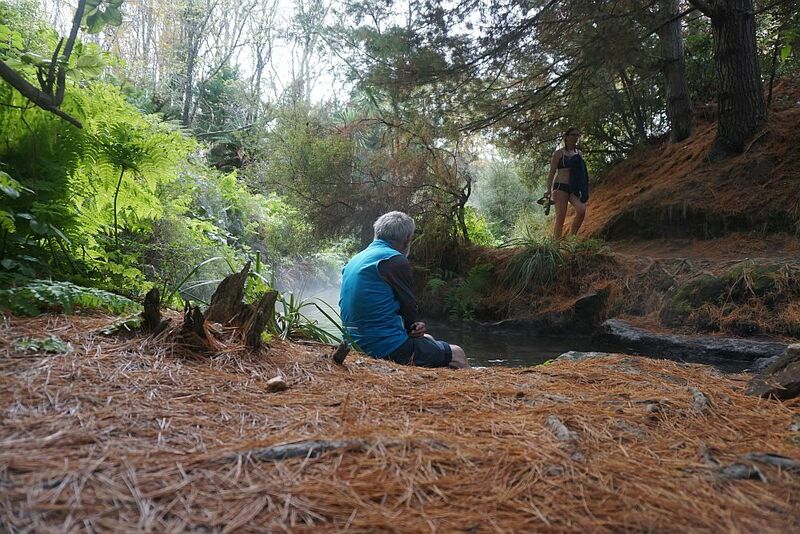 The water is also suitable for soaking tired feet after the walk to the summit of Rainbow Mountain. 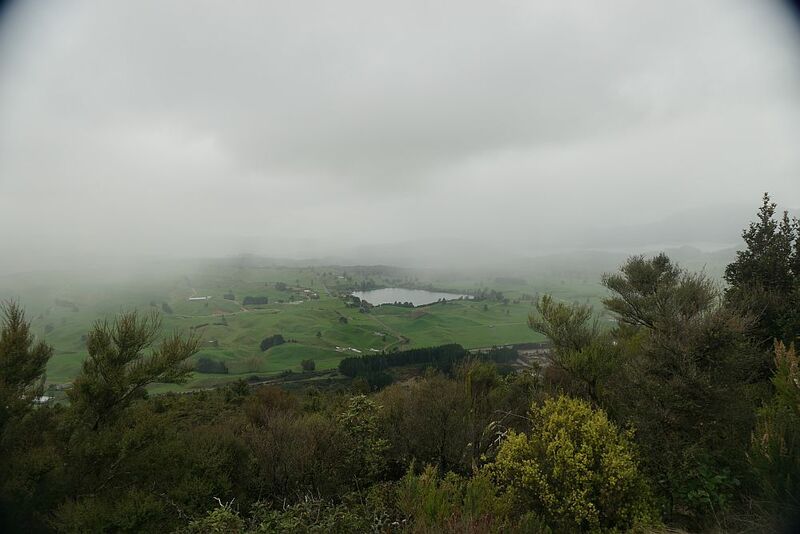 Green Lake seen from near Old Waiotapu Rd. Rainbow Mountain summit with the mast can be seen at the top centre of the photo. 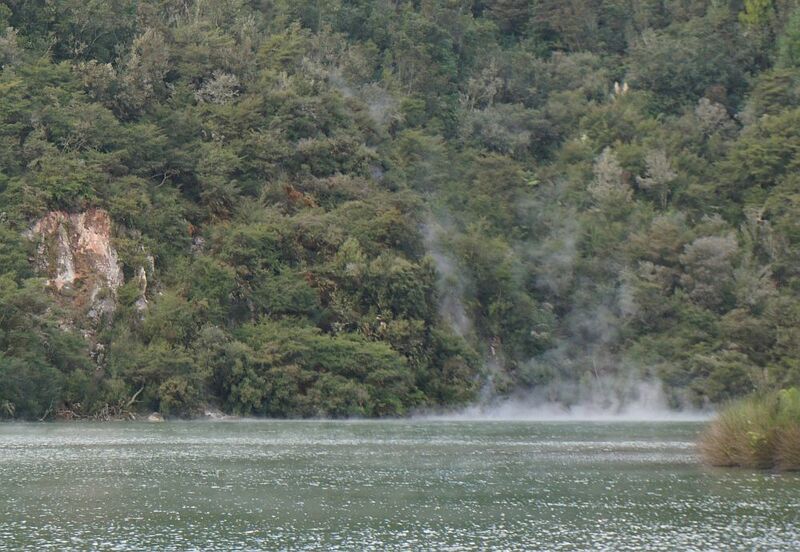 The water in Green Lake is warm, and steam can be seen rising from various places along the lake edge. Rainbow Mountain seen from SH5 north of the intersection with SH38. 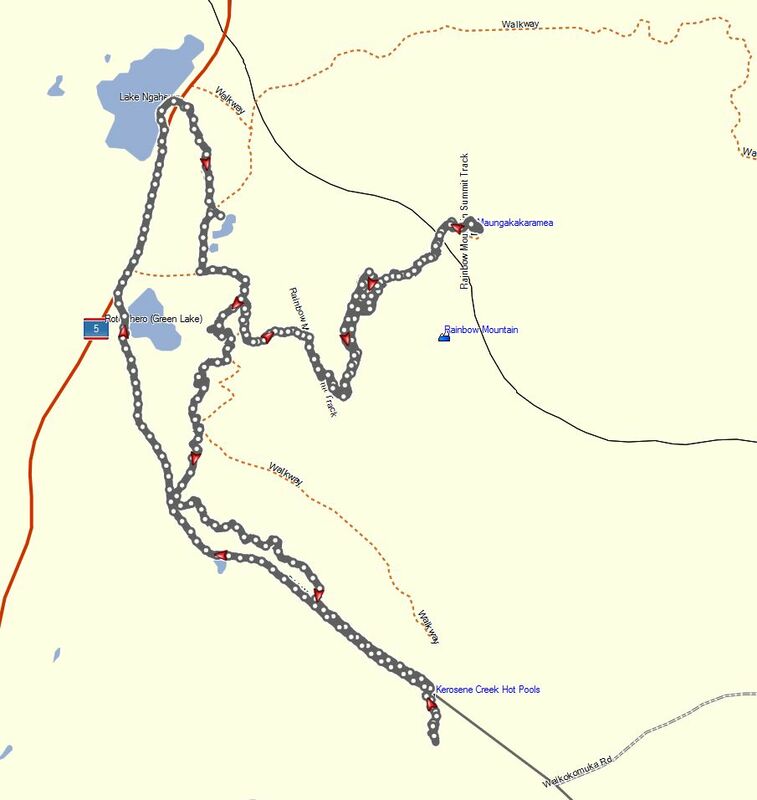 A GPS track log showing the path taken. 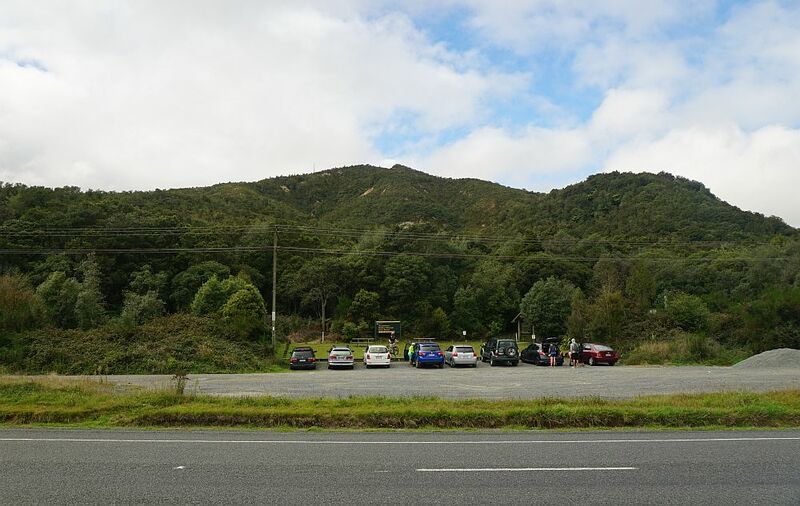 The carpark on SH5 is at the top of the track, the summit is the rightmost track point, and Kerosene Creek is at the lowest point. The carpark is at about 440m asl, and the summit at 743, so there is a total climb of 300m. The time from the carpark to the summit was about 1 hour, including time at the crater lakes and the other lookouts. From the summit to Kerosene Creek was about 1 hour 10 minutes, and from Kerosene Creek back to the carpark via Old Waiotapu Rd and SH5 was about 35 minutes. Total time including a lunch break at the summit and a foot soak in Kerosene Creek was 3 hours 30 minutes. Total distance about 11.5 kms. The track was walked on April 26, 2015. 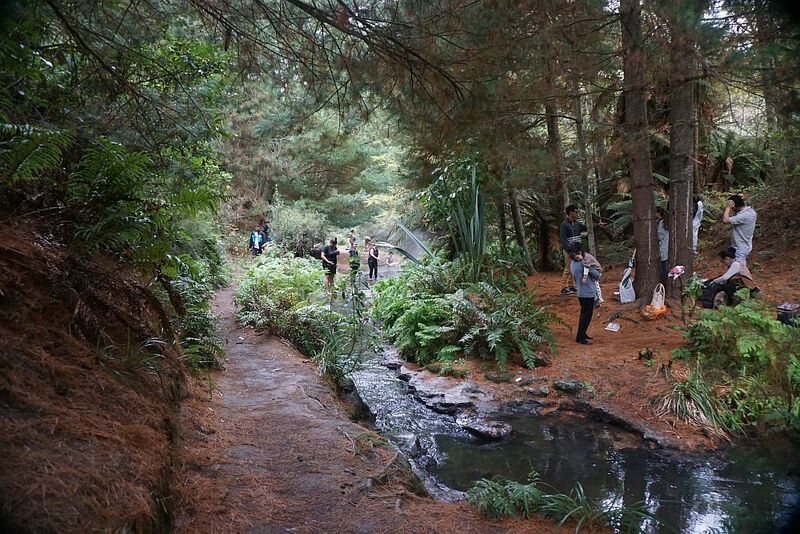 This entry was posted in Walks and tagged Kerosene Creek, Maungakakaramea, Rainbow Mountain, Rotorua, Taupo, Waikite, Waimangu, Waiotapu on 2015-04-26 by nzartig.